This Mac mini is powered by an 8th Gen Coffee Lake 3.2 GHz Intel Core i7 Six-Core processor that features a burst speed of up to 4.6 GHz, while 16GB of 2666 MHz DDR4 RAM helps to ensure smooth multitasking and also allows the computer to quickly access frequently used files and programs. The system memory can be upgraded to a maximum of 64GB. 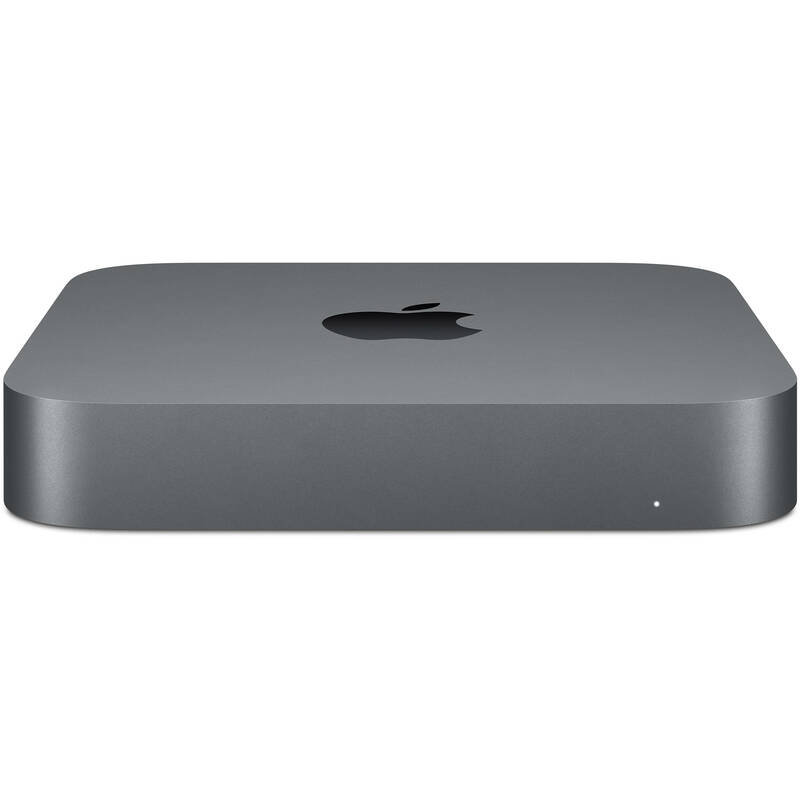 For storage of your files, this Mac mini is equipped with a 2TB PCIe SSD that has a sequential read speed of up to 3.4 GB/s. If you want to add external peripherals, four Thunderbolt 3 ports support bi-directional transfer speeds of up to 40 Gb/s, while also supporting 10 Gb/s USB 3.1 Gen 2 (USB 3.1), device charging, and an external GPU. Thanks to two 5 Gb/s USB 3.1 Gen 1 (USB 3.0) Type-A ports, you'll still be able to connect other devices to this system. Gigabit Ethernet is built in for wired networking, or use dual-band Wi-Fi 5 (802.11ac) for wireless networking. Bluetooth 5.0 technology will allow you to connect additional compatible peripherals, including keyboards, mice, and headsets. Sound is output using a 3.5mm headphone jack. Apple's Mac mini (Late 2018) operates using an internal 150W power supply that runs off 100-240 VAC at 50 to 60 Hz. The Mac mini features 16GB of high-performance 2666 MHz DDR4 SO-DIMM memory for faster rendering, working with massive files, or running multiple virtual machines. And now you can configure even more memory - up to 64GB - to run even heavier workloads. This Mac mini has a 2TB PCIe SSD with sequential read speeds of up to 3.4 GB/s, so you can load giant files and launch apps quickly. With a variety of ports, the Mac mini is ready for a variety of workflow configurations. Thunderbolt 3 is powerful and versatile, and the Mac mini has four of them. The HDMI 2.0 port delivers more bandwidth than its predecessor, so you can enjoy faster frame rates. For wired network access, take advantage of the integrated Gigabit Ethernet port. With its 2TB PCIe SSD, fast performance, and small footprint, Mac mini becomes a live musical instrument with MainStage on some of the world's largest concert tours. Box Dimensions (LxWxH) 10.5 x 10.2 x 4.5"
Mac mini (Late 2018) is rated 4.6 out of 5 by 98. Rated 5 out of 5 by Anonymous from Not perfect but really great. Ive always been a Mac mini fan. I like both the concept and the execution. The new mini is very fast. Its well know low point is the weak video card but for photography that is not much of a flaw. I appreciate that Mac minis probably cost more than they should but I prefer using it over my well-equipped HP Z230.